I love Duolingo as a language learning tool. 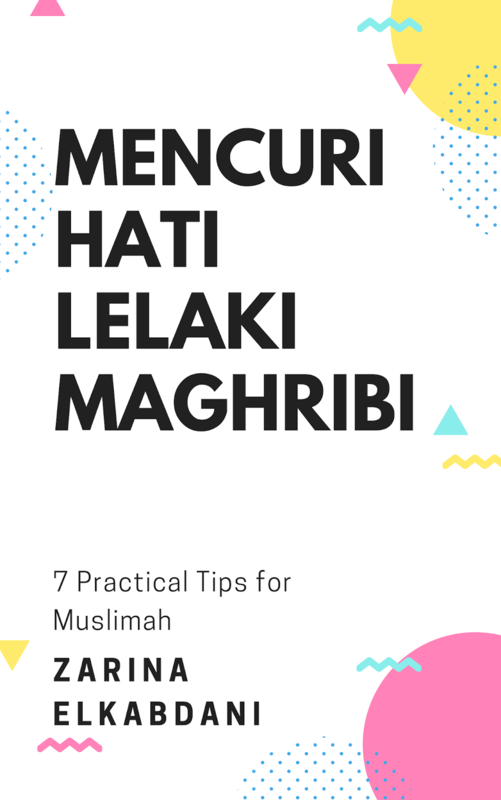 It has pretty interface, very light, simple exercises that don't consume your brain power too much and has many languages for learners wanting to brush up their skill. Having said that, I honestly do not attend proper class to study Spanish and since 2013 I have been hopping from one textbook to another and frequently use Duolingo to keep myself in track. 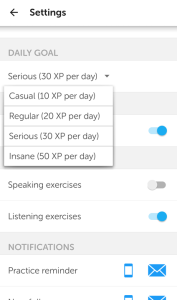 What I really love about Duolingo? First, It is FREE!! Nothing can beat a free app in your smartphone. 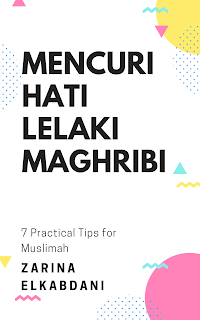 Not only it is free but it is also educative. Although you obviously cannot magically speak Spanish fluently in a day just by using Duolingo, but being able to start communicating using a few phrases of another language is definitely COOL, right? You can run duolingo in your computer, tablet and smartphone. I love it on my Android and I put myself into 3 lessons per day goal for about 15 minutes. As it is fun, sometimes I don't feel like I am learning a language. 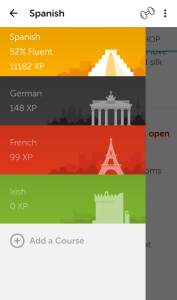 Duolingo feels like a game and very addictive! Second, definitely helping me in building my vocabulary bank. Although from time to time I still need to check with a dictionary just to make sure that I can differentiate the masculine from the feminine noun. 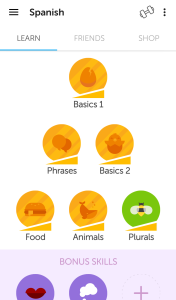 There is no grammar explanation in Duolingo though (which I wish the team could include that in their future updates) so I still need to learn some grammar first before attempting the lessons. As I progress, the lessons become progressively difficult too. It makes learning fun when the lessons get harder. Third, the forum ( I like to call it as such for now). In each test sentence or word there is an accompanying section where you can comment and give your opinion. 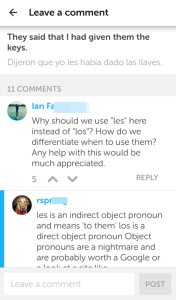 I definitely can learn a lot from other native speakers' comments be it if they are Spanish from Spain or from other Spanish speaking countries. Fourth, the daily goal. I can do one lesson per day, three or five. Depending on my strength or whether I really want to push myself to learn Spanish faster or not. I have opted for 5 lessons per day (insane) previously but from my own observation, I became very bored once I reached the 4th lesson. It is as if I am forcing myself to learn. Hence, I am l sticking to 3 lessons per day goal. Yeay! I am categorized as a serious learner there. 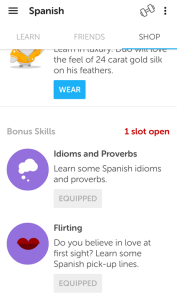 Fifth, finally...I love this added bonus skills like idioms, proverbs and flirting where I can practise it with my husband and we laughed like crazy whenever I used them incorrectly. Hahaha...Learning Spanish with Duolingo is seriously fun! When I look back, I don't know why there was little to none interest in me to learn Spanish before. It seems natural to learn Spanish after English, right? No! The only thing that connects me to Spanish culture before was the Spanish telenovela. Among my favorites was the Venezuelan telenovela Mi Gorda Bella in 2002 which was adapted to Manjalara - a local Malay drama in year 2007. But now with Duolingo, I think I can revive my interest in Spanish language and make myself study a little bit harder than before. Alhamdulillah. Vamos a aprender Español ! In my opinion, Plaza Mayor is a must visit Madrid tourist spot if you have never seen such architecture before. It was built during the year 1598-1621 of Philip III's reign. The plaza is rectangular in shape and on top are the residential buildings. OMG, people do live here! I wonder how much the rental is. Quite costly I suppose as it is central of Madrid. There are a lot of plazas in Spain and even in Europe. 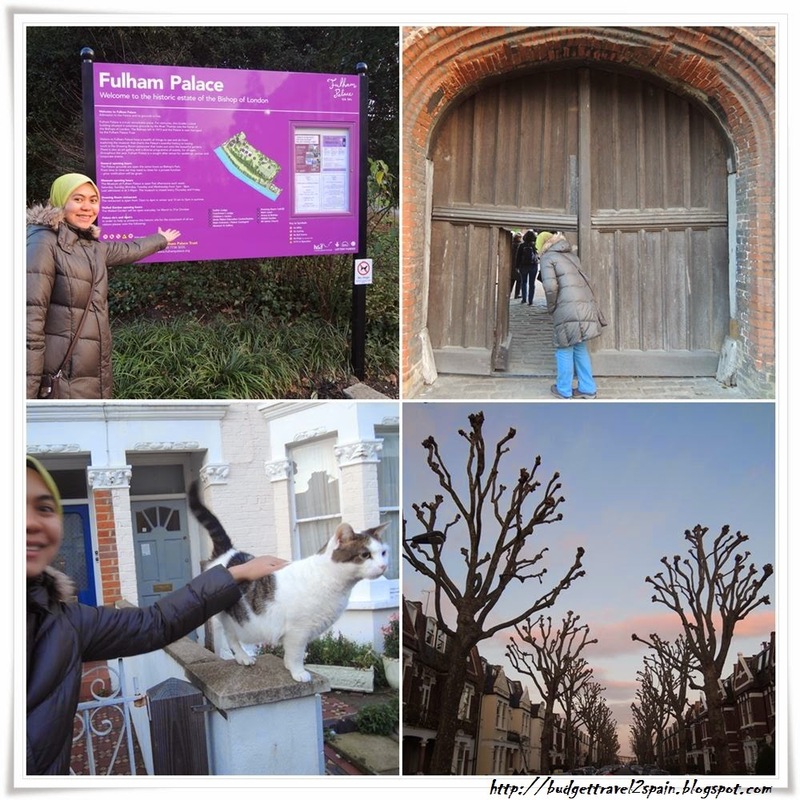 Plaza means a public square, marketplace or similar open space in a built-up area. I am not Spanish and initially I just pronounced the word as 'plaza' with the hard 'z' in English. Unbeknownst to me, Plaza 'Mayor is pronounced as 'Plasa Mayor'. The letter 'z' in Spanish is pronounced as 's'. Such as the famous local brand, Zara is pronounced as 'Sara'. At first I felt weird but after some time it has become my second nature. Time will heal my hard tongue. 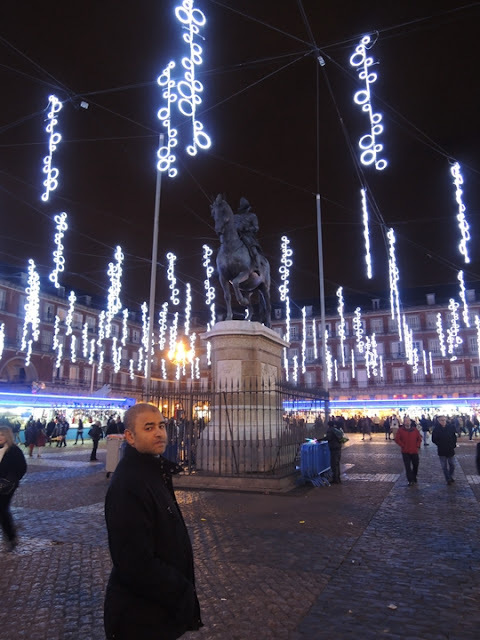 Hehehe..
Back to Plaza Mayor...I love the view of the plaza be it during the day or at night but I really adore the sight of Plaza Mayor particularly when it is around Christmas time. The lights displayed enhanced the aesthetic of the architecture more. Remember my post of another plaza; Puerta del Sol recently? 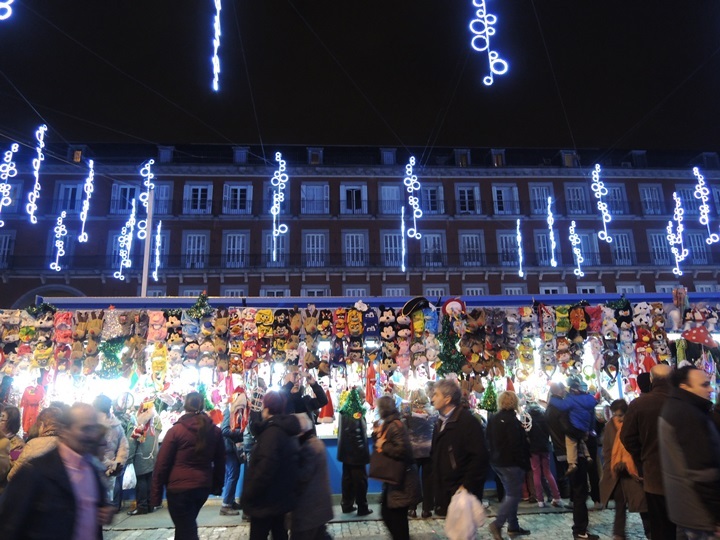 Plaza Mayor is just walking distance from here. If gauged by Google Map it is around 3 minutes. Really close! 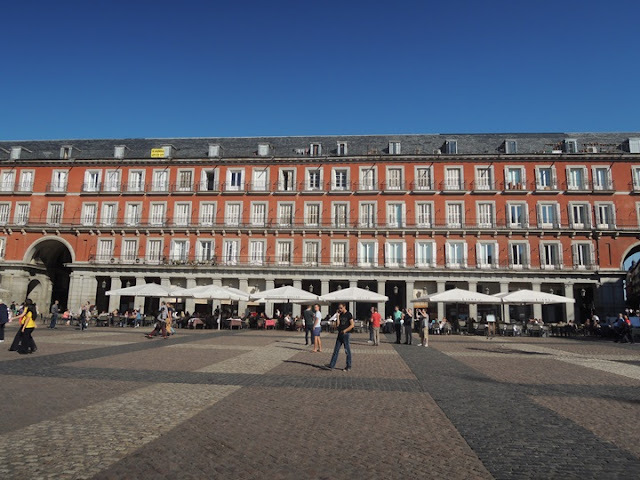 Do you see the white umbrellas lining out the terrazzo in front of Plaza Mayor? They are cafes where Madrileños and visitors alike sit, sipping a relaxing cup of cafe con leche ala Ana Botella (ex-mayor of Madrid) while enjoying the majestic amber architecture. FYI, there is a slight price difference between eating inside and outside at the terrazo. Eating outside is much more expensive. Depending on the establishments, some can be from a few centicimos (cents) or much higher. Madrid Tourism Center is located here too in one of the sections called as La Casa de la Panaderia (Bakery House). In Spanish it sounds sexier huh? It reminds me of the Spanish telenovela shown in Malaysian local channel when I was in middle school. See the Spanish traditional costume in the picture above? 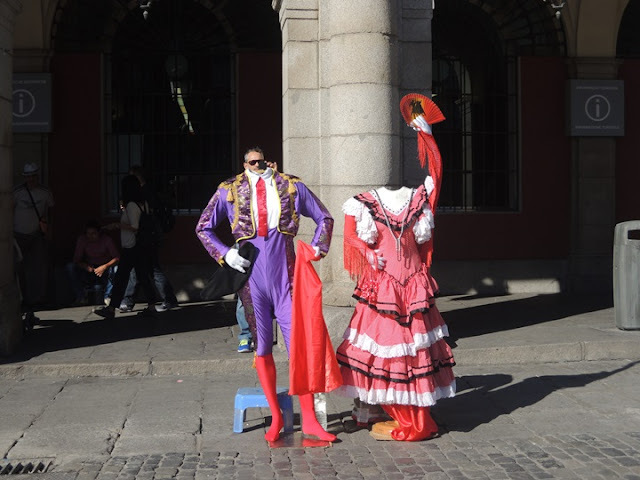 They are the street art performers donning costumes for photo opportunities. It is not FREE. Depending on them, you should ask for their price first before snapping your camera. 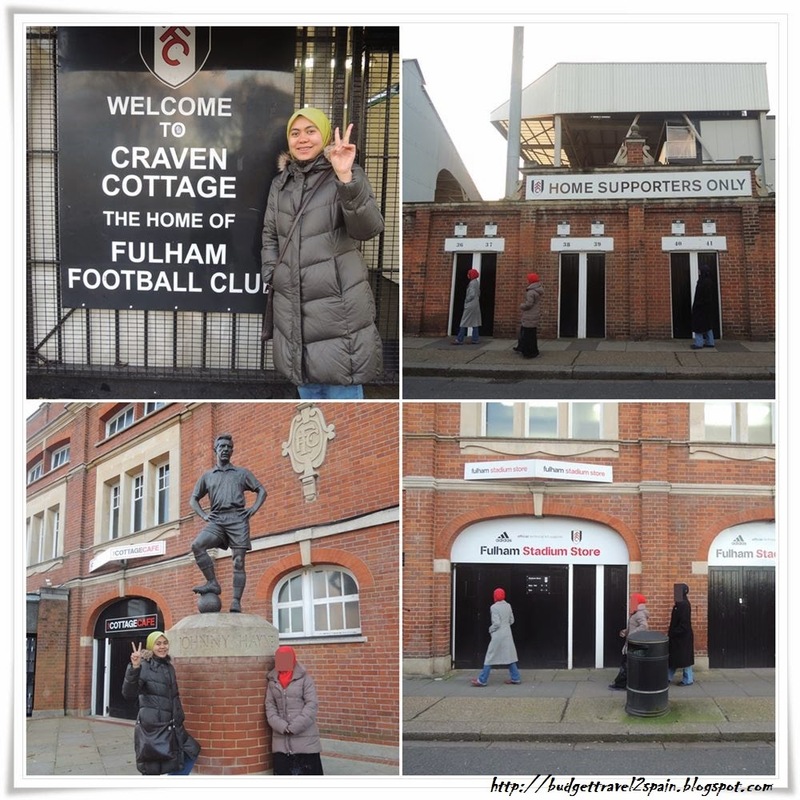 I paid a euro for a photo with them but at Real Palace, I had to pay four euros per person! I love the cobbled stones paving the road here in Plaza Mayor. They add up to it's aesthetic value. Such as this road leading to another Madrid tourist spot; Mercado de San Miguel. 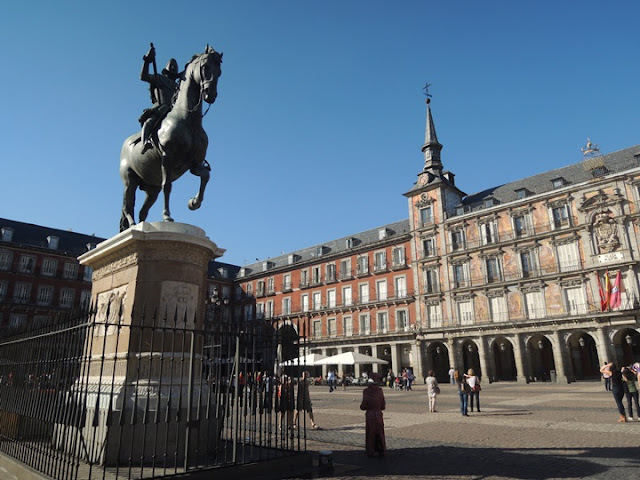 How to go to Plaza Mayor? You can reach here easily either by Metro line 1 (blue) ,2 (red) , 3 (yellow) or Cercanias to Sol Station and walk a bit. 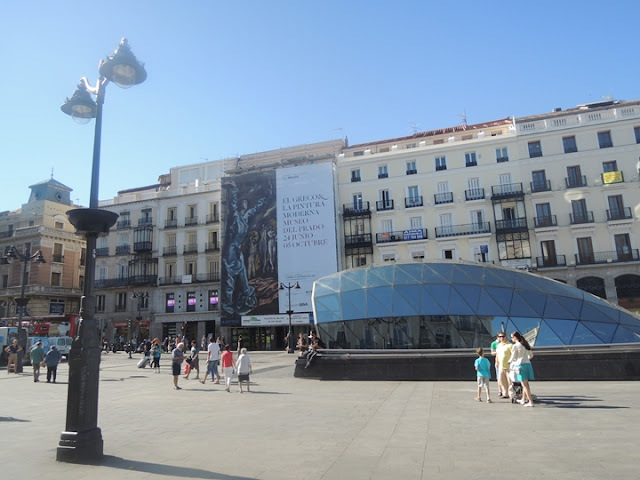 Puerta del Sol is just two stations away from my house and normally I will either stop in Atocha station and walk to Sol (which I normally call it). 23 minutes or if you walk pretty slowly about 30 minutes. It sounds a lot of walking but trust me, you won't feel it especially if you are in Spain during one of the best seasons IMO. 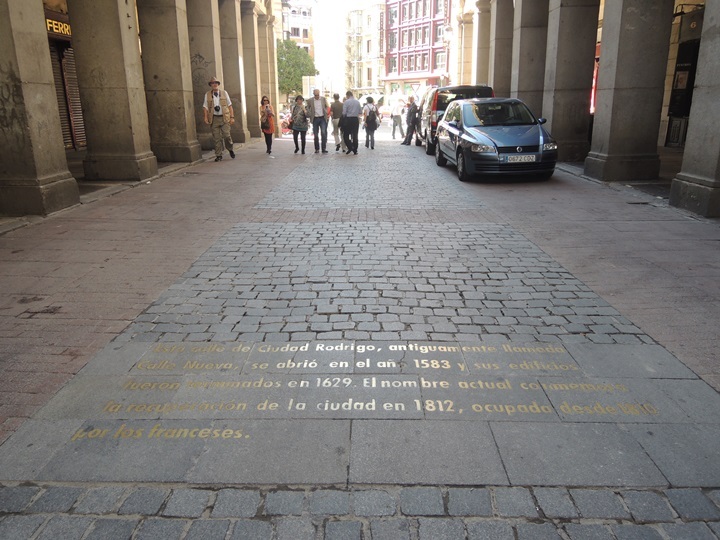 The center of Madrid is occupied with so many aesthetic architectures and soon you will be lost in time. Never realizing that you have walked that whole 1.8 ~2.0 km. 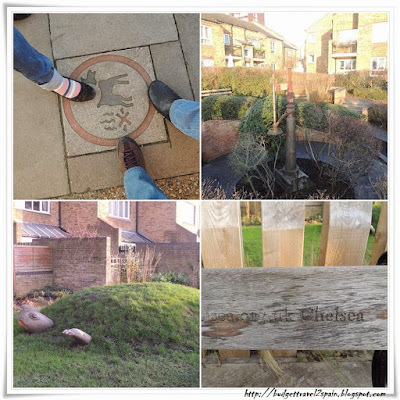 It is really an amazing walk and we love walking around this area. Del is de + el means of the. 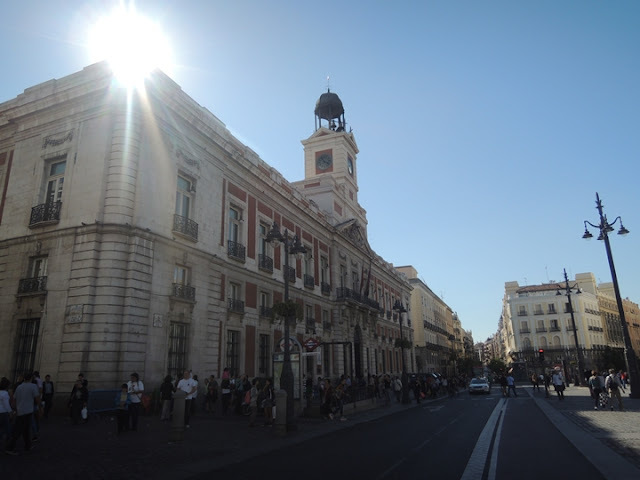 Puerta del Sol means door of the sun. 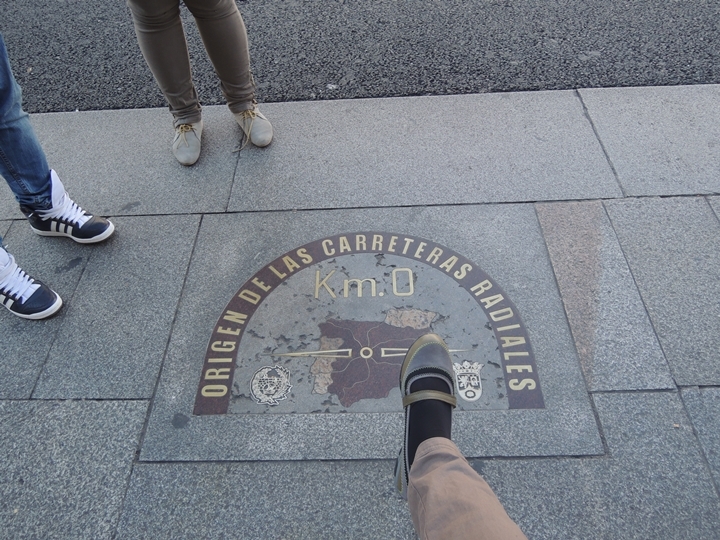 This is the location of the 0 km, which means the center of Madrid where all the Spanish roads start. Right in front of the 0 km walk of fame is the clock building where the Spaniards or anyone who wants prosperity for their life in the new year ahead will eat twelve grapes (las doce uvas de la suerte) at midnight right before the clock strikes 12 on the 31st of December every year. Around this time whenever we want to buy some grapes, we realize that there is a spike in grapes price. Demand and supply rules! What can you do in Sol? 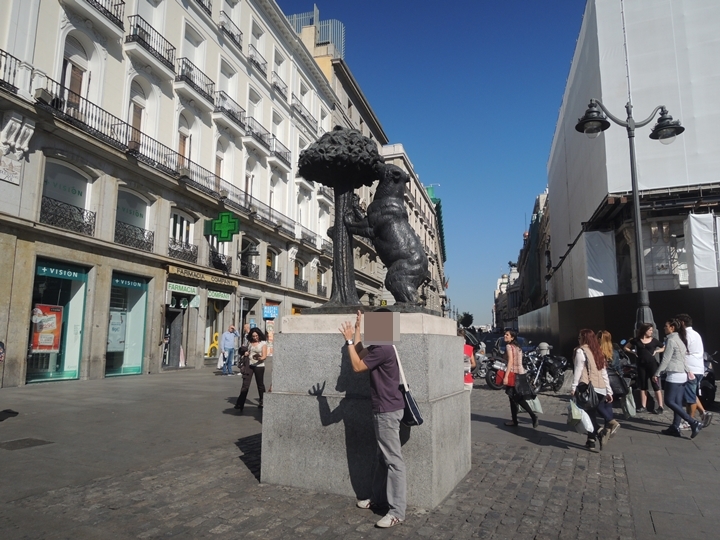 Right in the center of Sol Plaza, you will find the bear and strawberry statue (El Oso y El Madroño); the most famous symbol of Madrid (other than Real Madrid FC and Christiano Ronaldo hehehe). 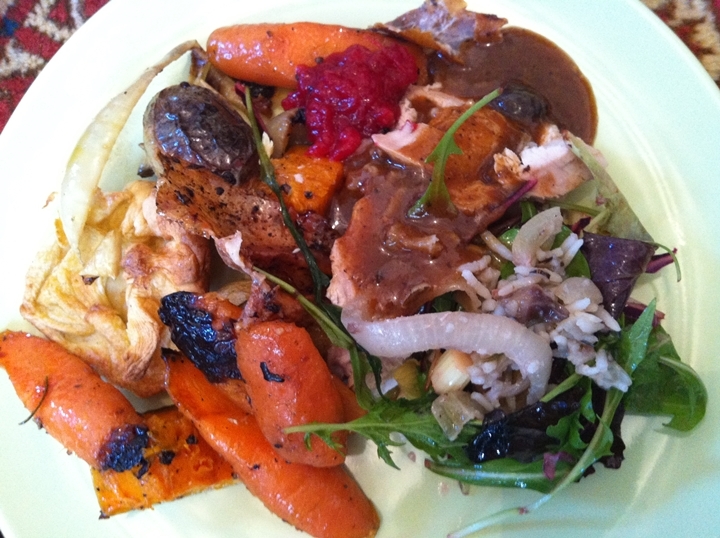 Other than that of course food gastronomy. 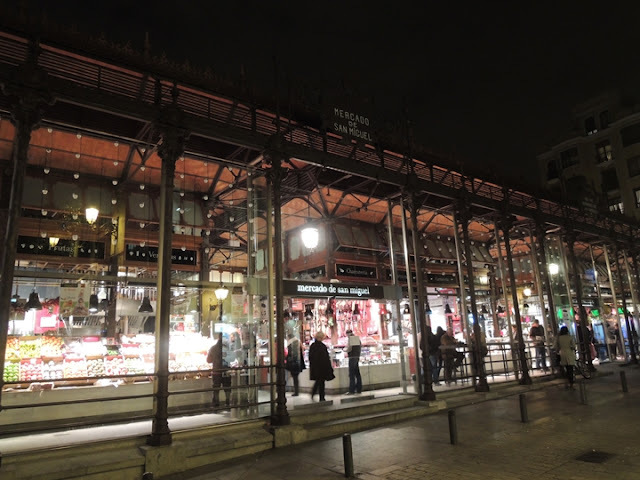 If you want to try tapas (wide variety of appetizers and snacks in Spanish cuisine), you can visit Mercado de San Miguel, one of the oldest and most beautiful Madrid's market. 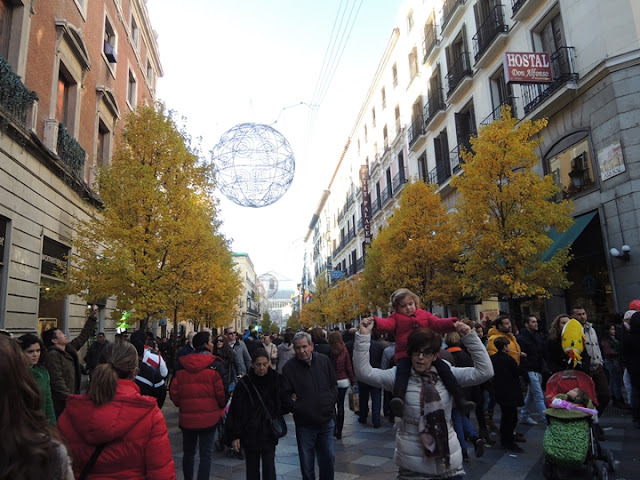 You can watch theater or musical at one of the many theaters along GranVia, watch movie at Callao, shopping at famous local brand names like Zara, Mango, El Corte Ingles and etc. 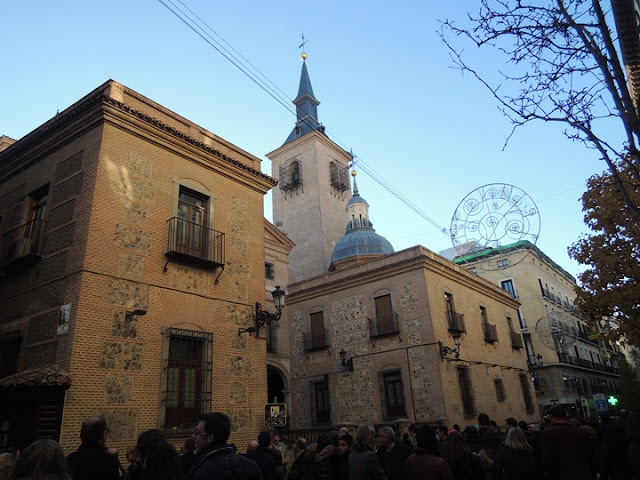 Plaza Mayor is just walking distance from 0 km. 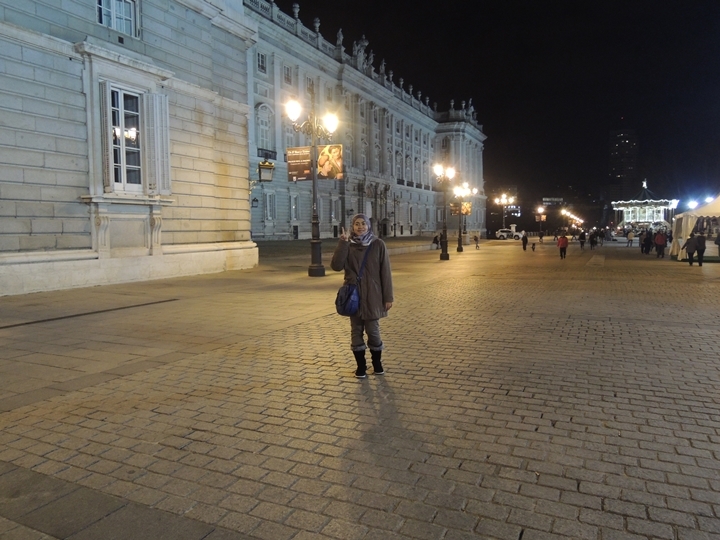 The Royal Palace (Palacio Real) is very near too about 10 minutes walking distance from Sol, a little less than a kilometer. There are so many attractions nearby Sol and every major ones are just walking distance. I always advise my friends who normally have only one day to spend in Madrid to stop by at Sol and then walk about from here. I am not really crazy about it because it reminds me of cakoi or youtiao in Malaysia but when churros is served with yummilicious hot chocolate dipping sauce, one dip is all you need. Make sure you ask for a glass of water too. It's normally free. You will feel very thirsty when you eat churros con chocolate. Try either San Gines or Valor. 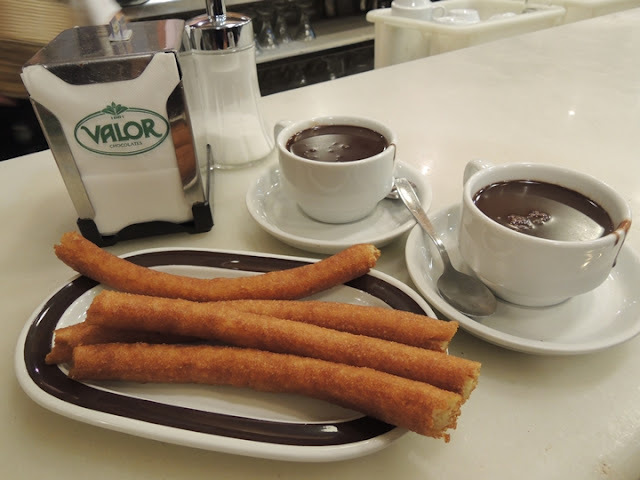 A plate of churros (4 sticks) with hot chocolate is between 5 to 8 euros. Don't forget to download all your maps from MetroMadrid before you come. I especially love their Touristic Map of Metro Network. It helps me a lot in planning where is the location of the tourist spots that I want to visit or if I want to omit them from my list. How to go to Puerta del Sol? You can reach here easily either by Metro line 1 (blue) ,2 (red) , 3 (yellow) or Cercanias to Sol Station. This was the DAY 2 of the 3D2N Wales excursion on Saturday, 20th December 2014. This was such a sudden diversion from our intended itinerary. We checked out from Travelodge at Wrexham around 8am and the sky was still dark. 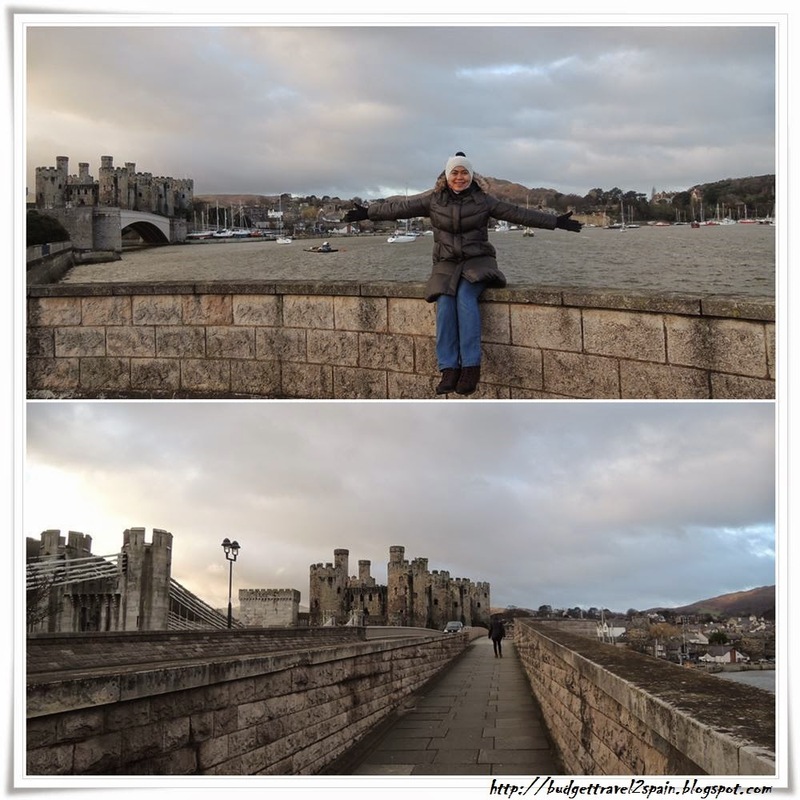 Our initial plan was to go straight to Conwy city to visit the magnificent ruins of Conwy Castle by the sea. 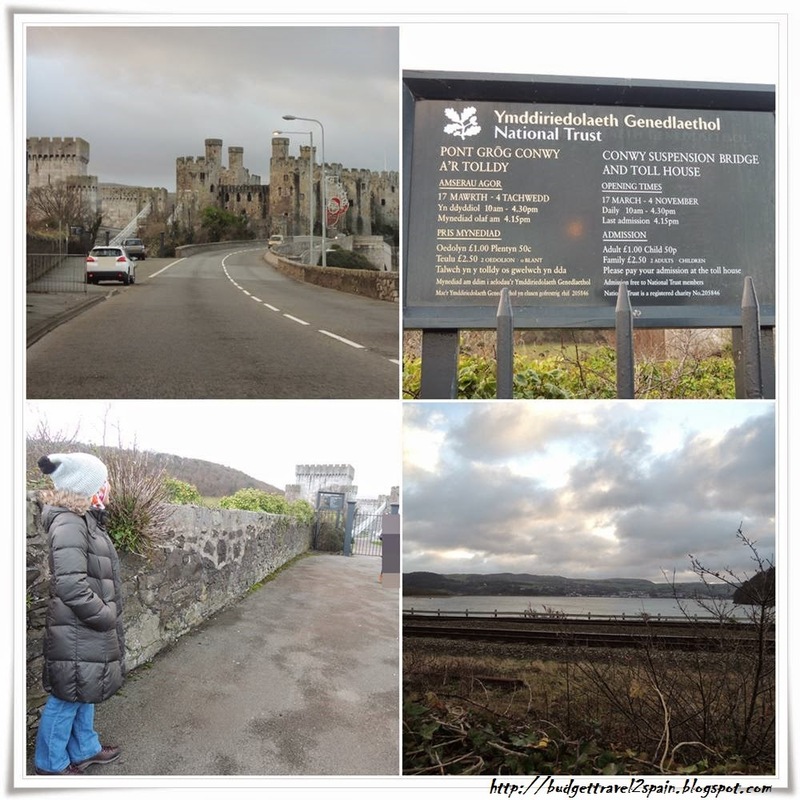 But...we saw Bodelwyddan Castle which was just next to the main highway en route to Conwy Castle. The day was still early so we decided to just checked it out. However, Bodelwyddan Castle is closed on Saturday. It seems that there is a hotel just next to or behind the castle because we tried to find parking but all was fully occupied by the hotel´s guests. Our only choice was to park right in front of the castle but not too long after parking our cute compact car, we were asked to go as we were not supposed to park here. ¨Bodelwyddan Castle, close to the village of Bodelwyddan, near Rhyl, Denbighshire in Wales, was built around 1460 by the Humphreys family of Anglesey as a manor house. Its most important association was with the Williams-Wynn family, which extended for around 200 years from 1690.¨ -Wikipedia. 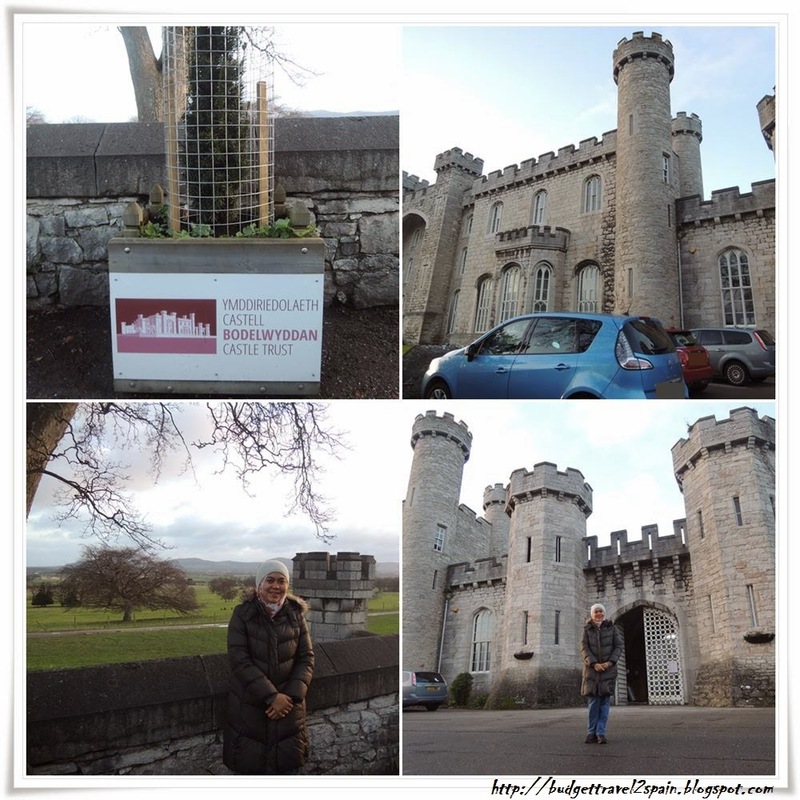 More information about Bodelwyddan Castle here at http://bodelwyddan-castle.co.uk/. The real deal..hehe from our original itinerary. 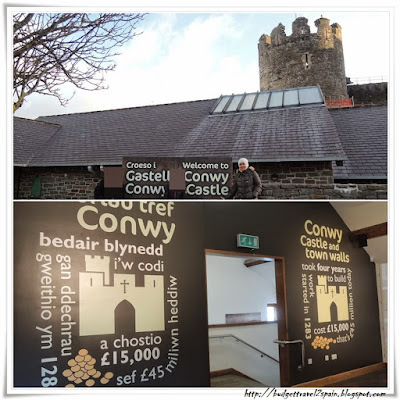 Conwy Castle was suggested by our friends as they said it is one of the many castles in Wales which is near the sea. It´s pretty breathtaking with the cloudy skies giving it a mysterious and somber background. 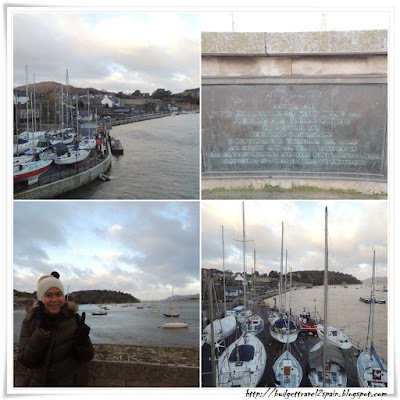 I wish I knew how to pronounce Conwy in Welsh but I am pretty sure I will ruin the awesome original pronunciation. It will be ridiculous..hehe. If you want to conquer Wales coast path, check out this awesome website : Wales Coast Path. 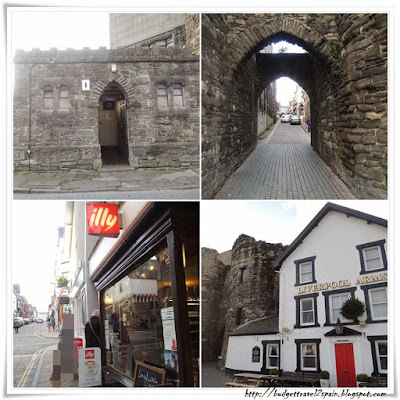 Enjoy the pictures of Conwy Castle and the area around it!! But..we decided to check out the city instead. By the time we walked towards the tourist information centre, the sun was shining brightly outside. It´s quite rare to get this kinda weather in the UK so I enjoyed it while it lasted. We stopped to buy some souvenirs here. I bought a fridge magnet and five pieces of postcards here which was a lot more cheaper than the other souvenir shop across the road. I was amazed with the restroom´s technology. You need to pay to enter - 20p per entry but I was glad that the restroom was really clean. Look at the small garden of herbs! 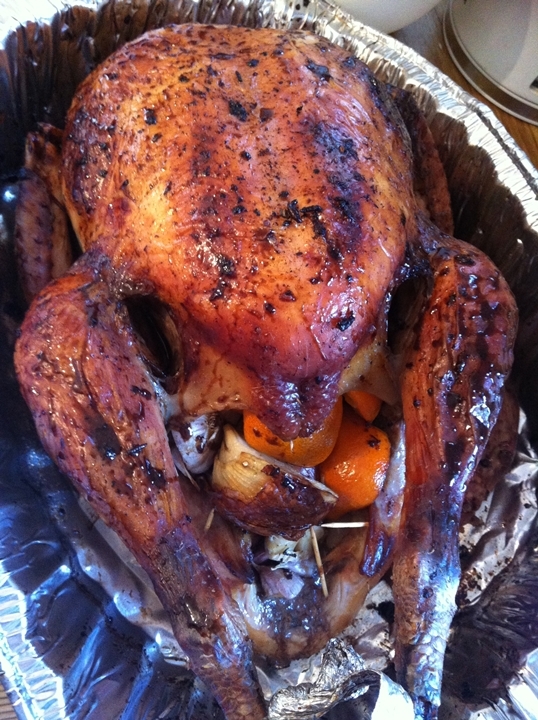 You can try to eat them. Pretty neat idea. 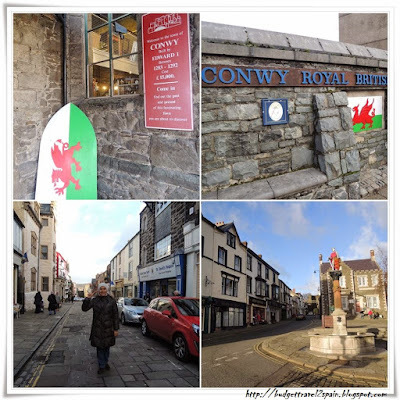 Conwy city, a very short walking distance from the tourist information center. 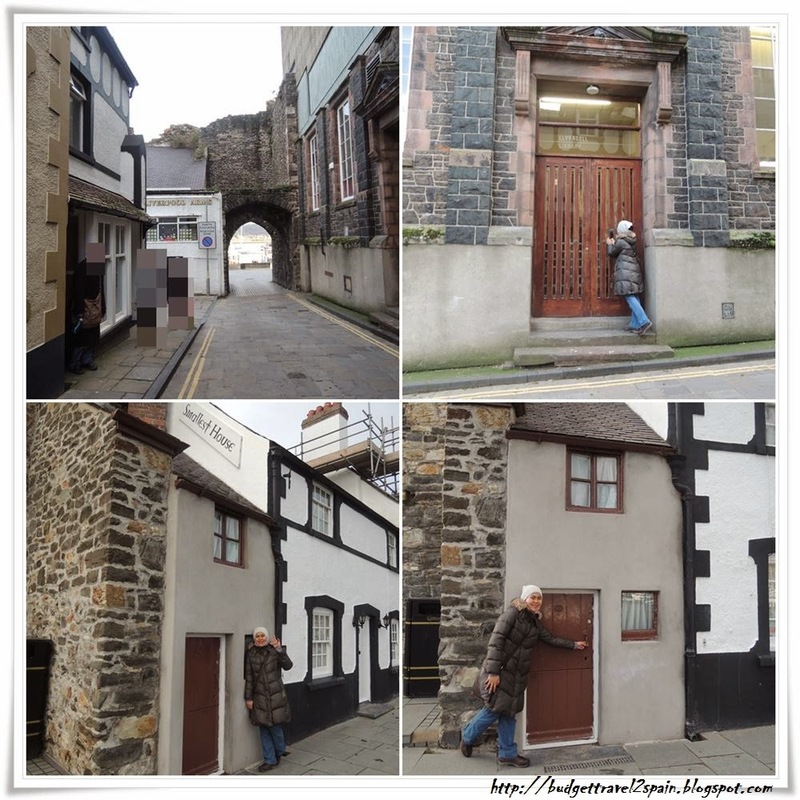 The bottom two pictures - Smallest house in Great Britain! After walking for quite a while, we decided to sit down for a cup of cappuccino near the smallest house and I was wondering if Illy would taste better than Costa but in the end I still prefer Costa. Hehe..
More pictures of the Conwy Castle. 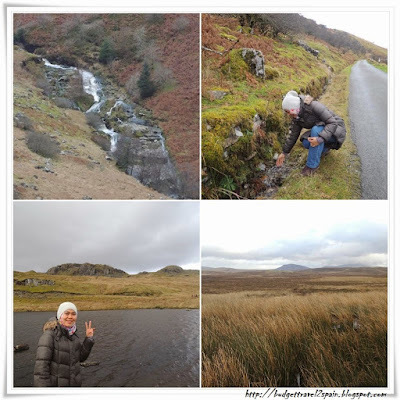 Alright...and it was now the time to explore Snowdonia!! By car..hehe. We didn't carry the right gear to hike up the mountain and we didn't plan to. Lazybums..huhu. Anyway it's freezing cold, but still I wanted to have a picture once without my jacket and the brave smile was a worthy one with a picturesque background like that. Subhanallah...brrrr..cold! There is a Ffestiniog train service if you want to explore Snowdonia from this side of the mountain. Subhanallah..now we were at one of the peaks of Snowdonia. Breathtakingly beautiful. Okay..not the Portmeirion pottery guys! 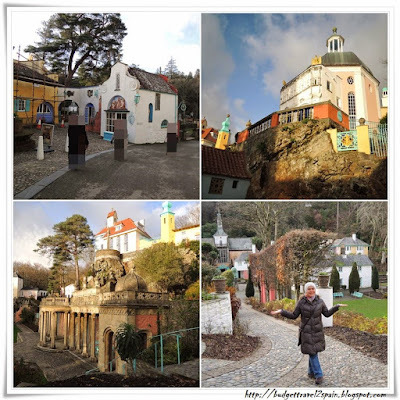 Initially I had the same idea but this is Portmeirion Village. 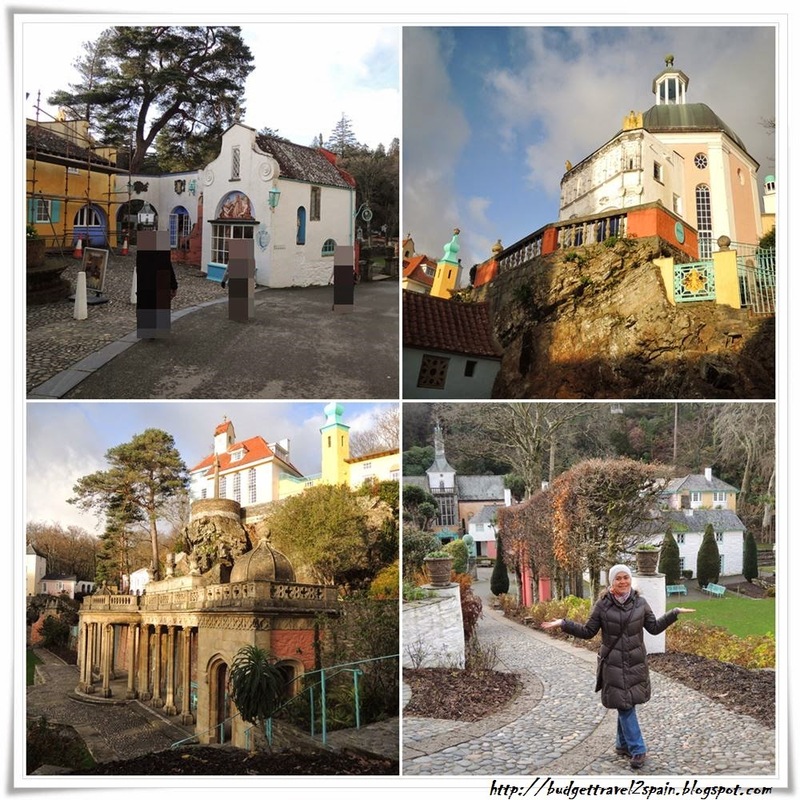 The place is an Italianate tourist village in Gwynedd. I wish that we had been here in summer. This place must be more awesome then. Anyway, it is a gorgeous place and if you have not been to any similar places before, it is worth a check. At the time, the admission fee is 10 Gbp for adult but if you have a student card, there´s a pound less. I miss this time...gorgeous scenery. Subhanallah. 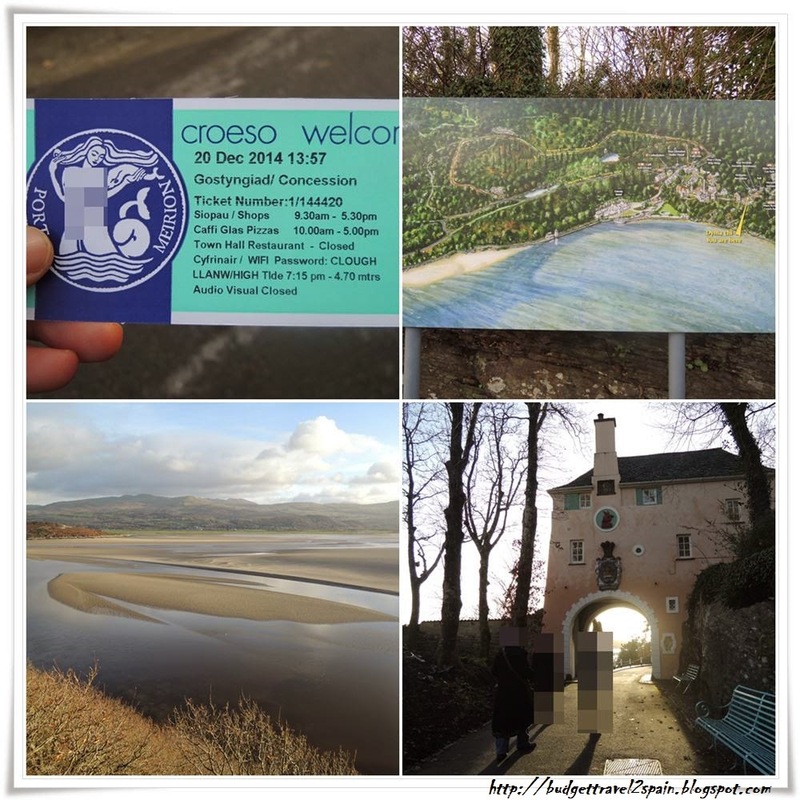 This was the DAY 1 of the 3D2N Wales excursion on Friday, 19th December 2014. Alhamdulillah, the day was a bright and sunny day when we woke up. The first thing was to pick up the rental car from Enterprise Rent-A-Car in Coventry. Initially, I did the car booking with full payment via the website about two weeks before the D-day. We did a comparison with a few other websites and found that Enterprise Rent-A-Car offered the cheapest rate. We thought so too at that moment. However...I just did not know why..about a week before going, the rate went down close to 40%!! We were pretty baffled. Then what happened next was that we booked another car with the cheaper rate to save our budget, naturally. Now, the rush to cancel ´that´ online booking started. Apparently, you can book the car and pay online but you CANNOT do the cancellation online. Alright...lovely. We had to call about three times to the customer service. First, to report the cancellation. Second, to inform the local office about the cancellation and lastly, to rectify if the cancellation was done or not. Not effective service. We did not get any cancellation report via email whatsoever and we demanded one just to be on the safe side. The ´Kiasu´ self inside me kicked in..hehe. Guess what, the refund would be completed within 5 business days. All in all..a lovely officer handled our call with great patience which I should applaud her for. Thank you! Alhamdulillah. We received a sky blue, brand new Renault Scenic with a built in really neat GPS which I forgot to snap a picture of. Totally fell in love with it! It reminded me of Perodua MyVi but more spacious and comfortable. 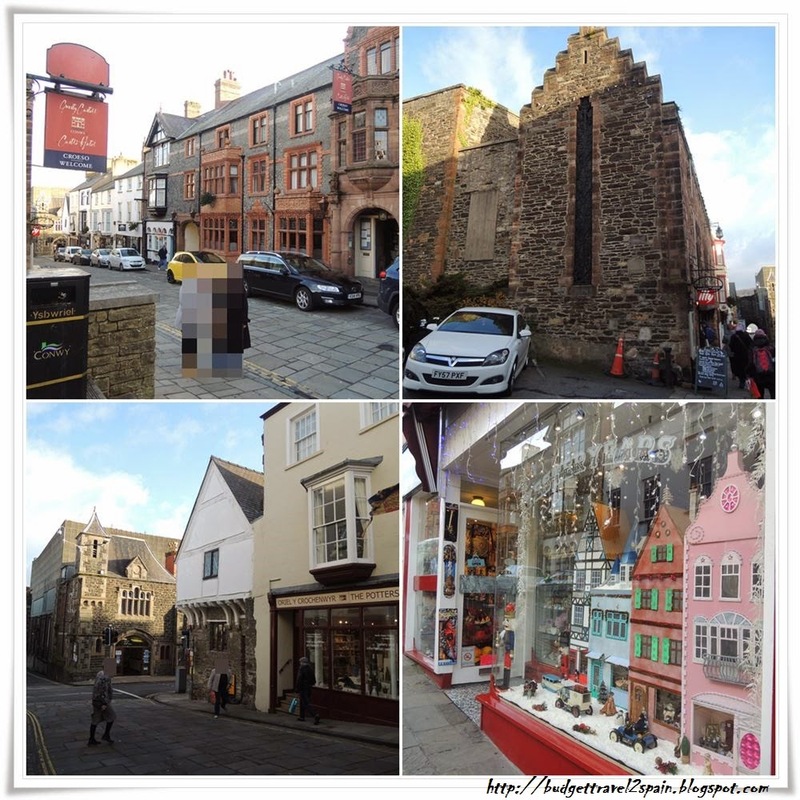 Check out the post for Wales Itinerary and Budget here. 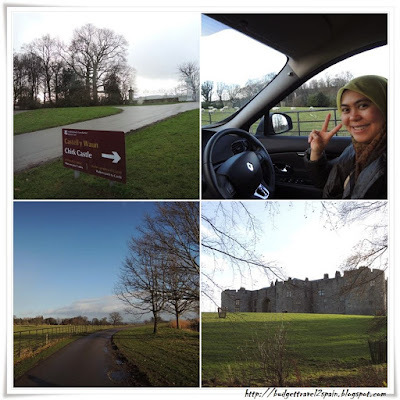 After picking up friends, we headed for the Chirk Castle. 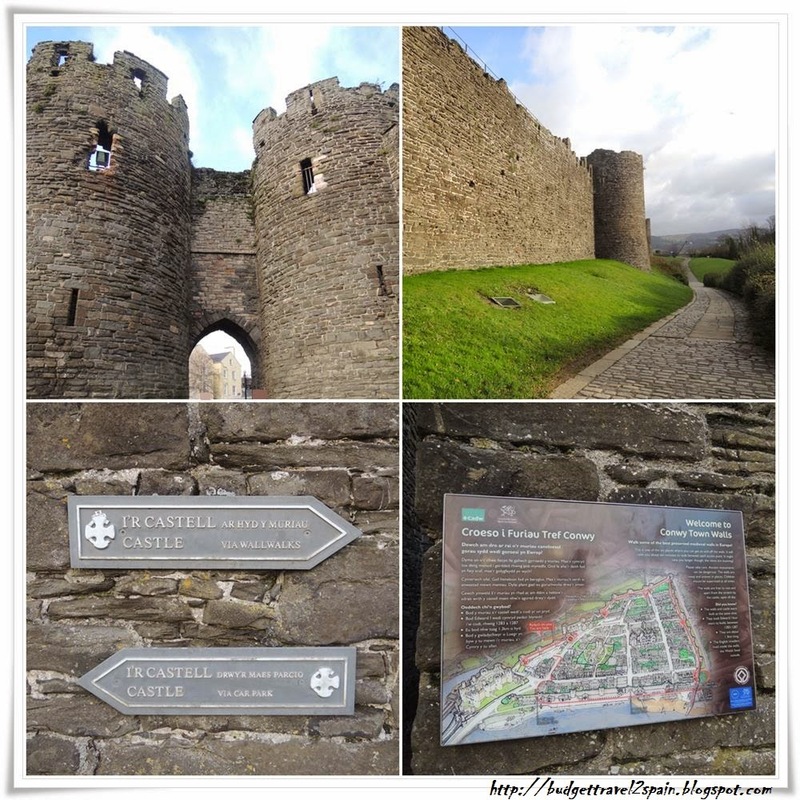 One of my aims of visiting Wales is to check out the castle. I haven´t been to any of the castles in the UK, not even the Buckingham Palace when the Queen was away for her holiday (Royal Day Out). No particular reason. I stumbled upon an itinerary for Wales here while planning out for places to visit and just pick one castle on the way to Llangollen. Since we would be going to visit Conwy Castle on the second day, we just had a preliminary view of Chirk Castle first. 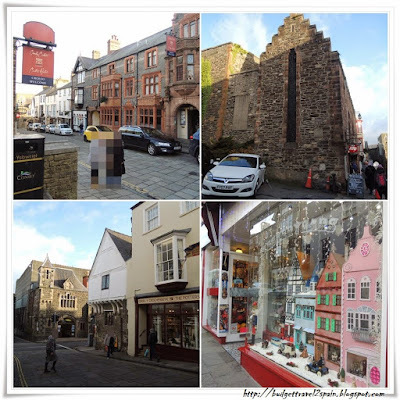 On the exterior, much of the castles in Wales look pretty similar. Check out the castle lists here. It was a pretty nice drive from Coventry to Chirk Castle because of the bright blue sky and we saw rainbow when we reached the castle!! We were exhilarated like kids. Hehehe..
After we parked the car, there was a slight drizzle but we still went out without an umbrella hoping that the rains wouldn´t get worse and indeed it wasn´t. Alhamdulillah. 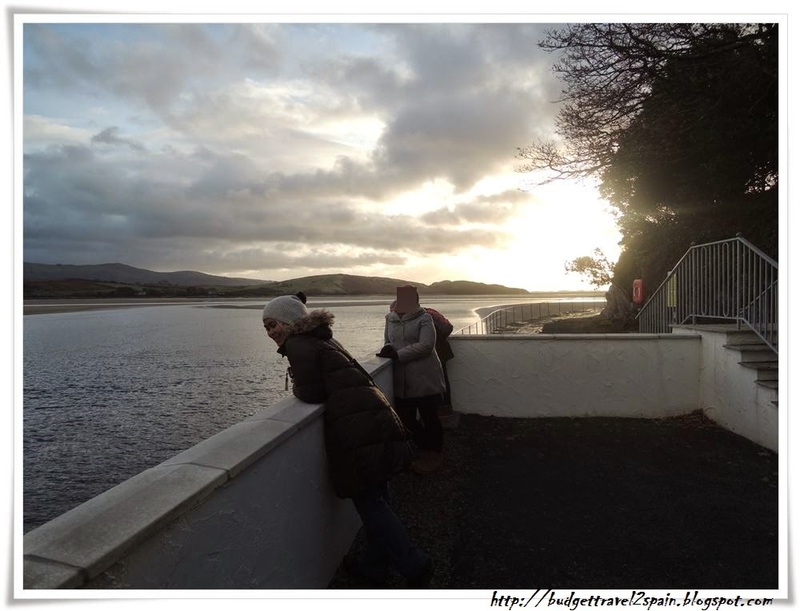 We were dazzled so much by the nature´s beauty that we forgot to check out the ticket counter first before climbing up the hill. The information office is just right next to the parking lot and all four of us missed that building. Talk about clueless! Lol.. The next best thing was, we thought that the entrance of the castle was from the garden and again being dazzled by the tidiness of the garden, we snapped some pictures first. Alright...next to the correct door! Well...yet again, we were pretty close to the right one. A man dressed up with fine ancient Welsh costume, perhaps during the castle´s era approached us and then we were caught of entering the castle without a ticket! Hahaha...he told us to get any one of us to go back down to the hill with the shuttle van just right outside of the castle´s door. When I tried to snap a good picture of the castle, a van was sitting right in front of it and I grumbled, ¨Why this van is here? I hope it´s out of the way!¨ Well...my curiousity was answered a bit later. The shutlle van was actually for picking up the tourists visiting the castle from the parking lot where the information center was. Hehehe. 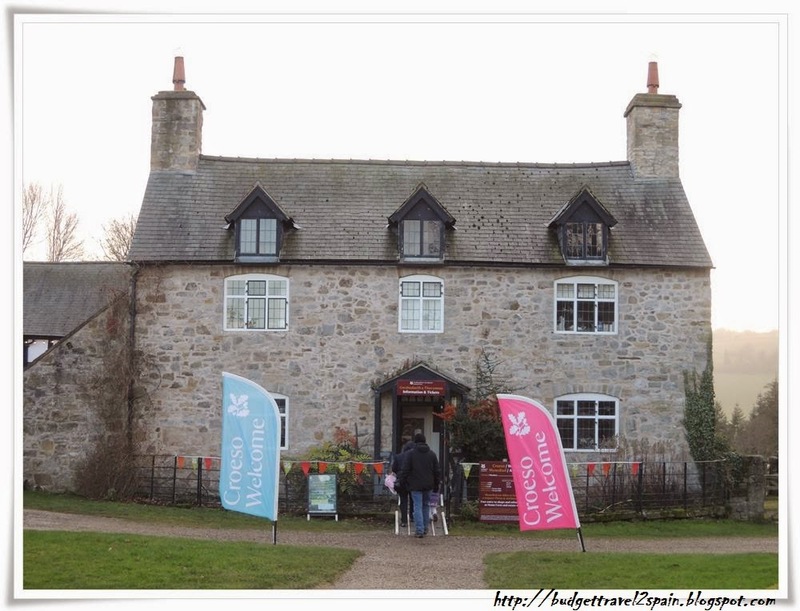 Get more information of Chirk Castle at http://www.nationaltrust.org.uk/chirk-castle/. We tried some of the warrior costumes without even paying the admission. I felt kinda sorry, really! But none of us was willing to go back down the hill after that hiking up the castle. Snap, snap and snap some more pictures and listened to the guy explaining about the castle. We were reluctant to get inside the castle as some of us had already visited some castles in the UK and they said they were the same. Being a good spirit, no time shall be wasted waiting. Yeahhh!! 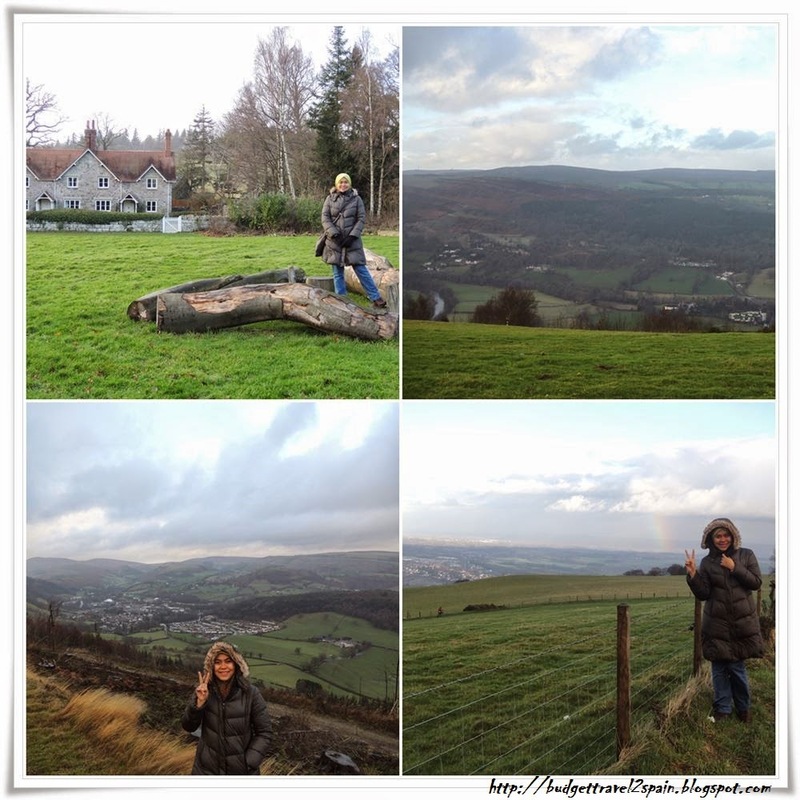 Let´s head to the next destination; Llangollen. We did not thoroughly research about what Llangollen has to offer or what not and we drove and drove according to the neat GPS for LLangollen. 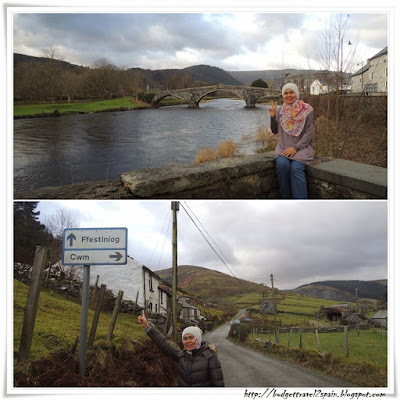 What I really like about the UK is that you could key in the postcode to search for the location, for example for LLangollen is LL20 and the GPS or Google Map will show the result quite accurately. 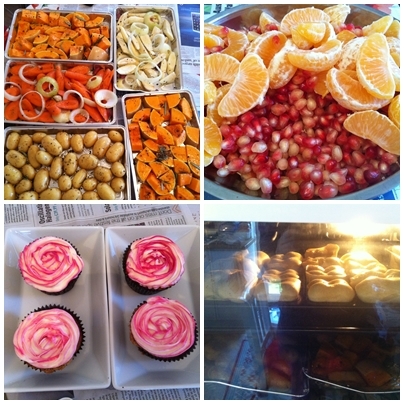 Easy and systematic. No headache. But..we are talking about Snowdonia here and we were surrounded by rolling hills and mountains!! Where were we heading??!! The rain was getting heavier and we lost our way even with the super neat GPS. Hehehe..
Wales´s to die for scenery. Subhanallah. And suddenly we passed by the Llangollen town after crossing an old bridge with a steady stream of river underneath it without we even noticing it. Hohoho..we laughed a lot in this trip. 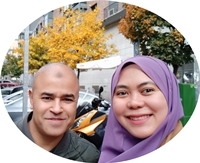 Alhamdulillah for the great time and travel partners. Why did we pass the chance to stop by Llangollen town? Time was running out. 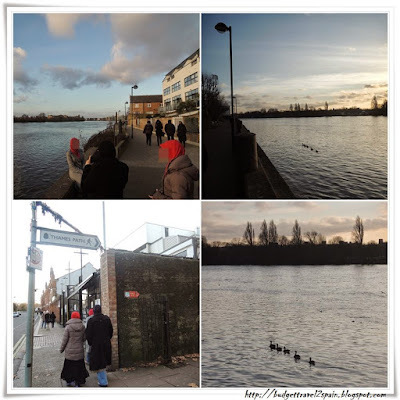 We haven´t prayed Zohor and Asar yet so we had to rush to check in into Travelodge and did our ´wajib´ (compulsory) deeds. Alhamdulillah. Travelodge is pretty cheap accommodation in the UK for budget traveller and if you are in a group of three or four, you can share the family room with an extra bed! You may need to pay extra for the WiFi though. 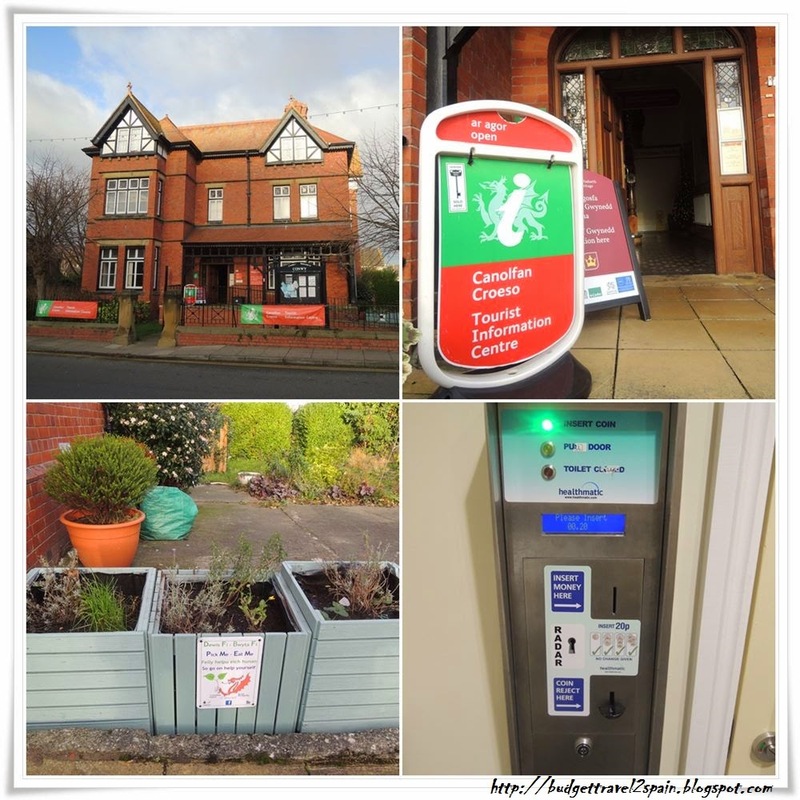 All basic facilities are there. No kitchen though. We booked a night stay each in two separate Travelodge. One in Wrexham and another in Porthmadog for this 3D2N trip. 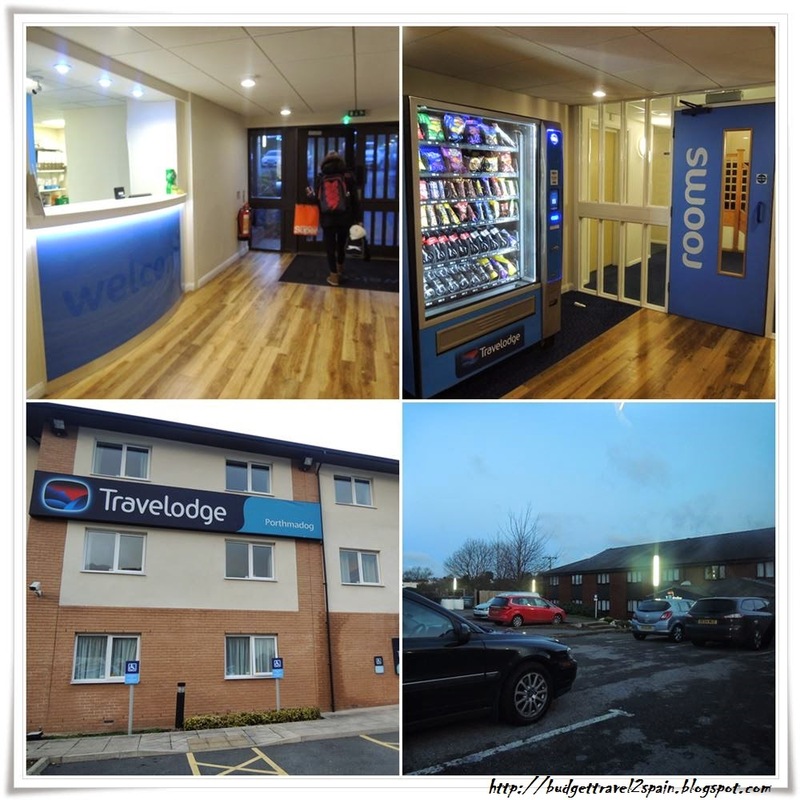 More information about Travelodge at http://www.travelodge.co.uk/. 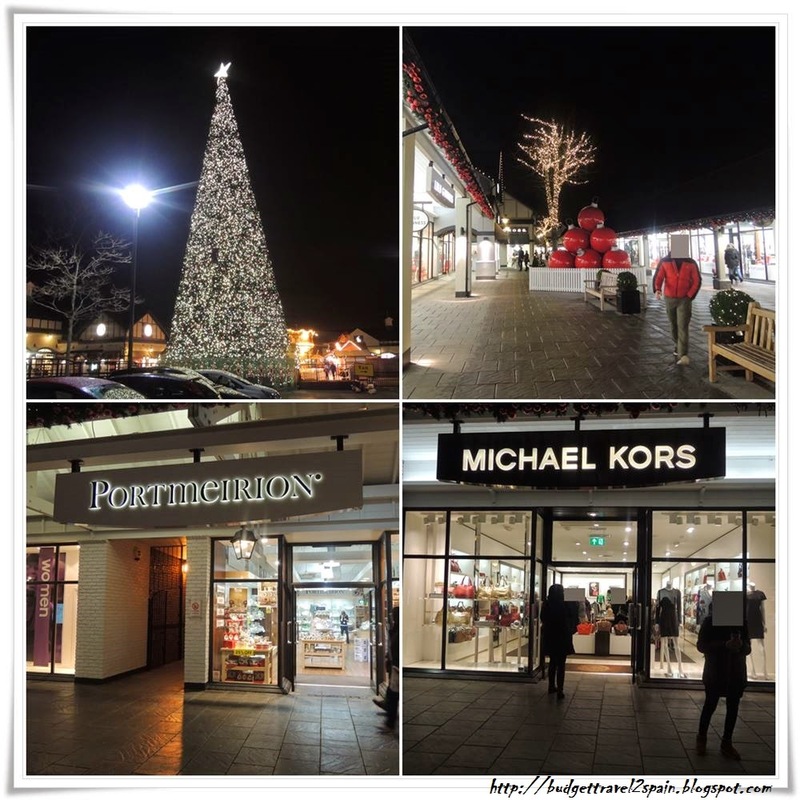 It was about thirty minutes drive from our Travelodge in Wrexham to Cheshire Oak Outlet. I didn´t buy anything at Cheshire Oak Outlet except for Costa Coffee´s tumbler even after ´tawaf´this area for two times and close to three hours. 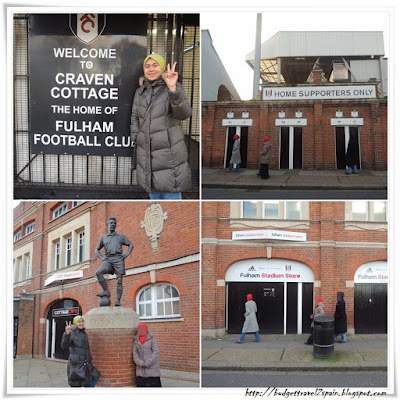 Make sure you check the opening times before you come from their website here. Most days they open until 8 pm but on weekends they close earlier.